We are in the middle of my 2nd guest bedroom makeover and I’m getting to the point where I need to decide what kind of bed I want. If I had my way I would put a beautiful queen sized bed in there so my daughters would be comfortable when they visit us. The reality, though, is that this is a really small room, that serves as a walk through when we don’t have guests, and we can’t even comfortably fit a full sized bed in there. I still have the futon in there but I want something that’s a little more modern, fits in the space and is better looking. 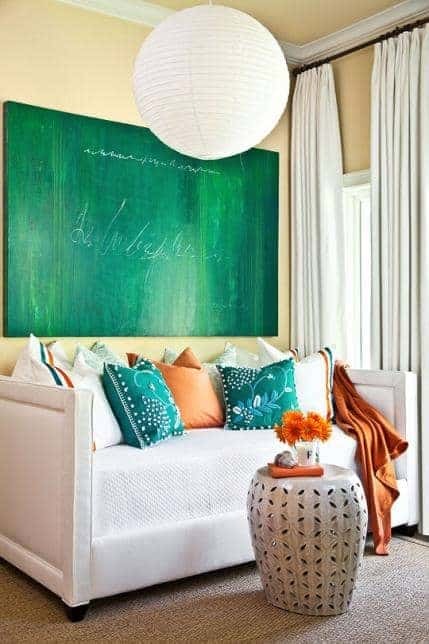 😉 We purchased it 10 years ago when we moved to Florida and had a similar type bedroom. It has served its purpose, but now that we are redoing the room, I thought it would be fun to build something to better fit our our needs and the room. It will probably have to be a twin sized bed, but we will still have another guest bedroom with a full sized bed and the futon will be in the basement if we ever really need it. Here are some ideas of what look I’m going for. Our bed will only have wall space behind it, kind of like this one. A lot of daybeds like this are built between two walls or bookcases. 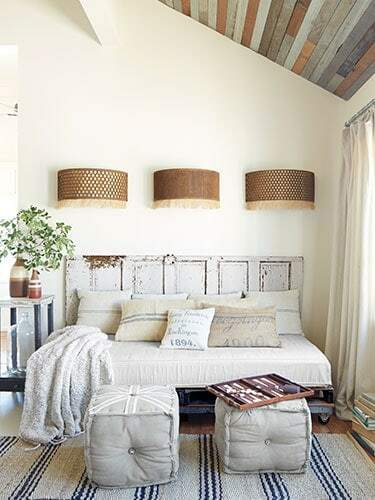 I like this bed’s clean lines and it has basket storage, which is always good to have in a small space. Like the PB one, I like the simplicity and open spaces underneath for baskets. I really love this one. Again, it has clean lines and I love the softness that the upholstery offers. It almost looks like a sofa. This one is simply made with pallets so it wouldn’t be an expensive project. I think I have enough rustic going on in here though, with my diy hanging light and my antique armoire. So, that’s what I’m thinking right now. Of course, things could change tomorrow. I’d love to hear what you think. Any favorites? The photo of Layla’s guestroom has been a favorite of mine for a long time. I vote for that one. Layla’s room is a favorite of mine too. Thanks so much for your input Gina! I like the first two photos. I have my son’s bed with drawers underneath in my spare room and it does give added storage in a small room. I guess I like the clean lines, and the crisp looks of those two photos. I have to do some searching for pics for my bathroom. See what I can find. I’m drawn to the clean lines of the first two also. Thanks so much for your input MJ.